We are on the brink of catapulting healthcare into one of the most fascinating discoveries of science: Nanotechnology. The coming technology (in progress now) will exceed anything we ever thought possible a couple of decades ago. Before we go any further, though, a simple description is in order. So we’ve established that nanotechnology occurs on an astronomically small scale. At this level, everyday materials have extraordinary properties. For instance, carbon nanotubes are one of the strongest materials known, up to 100 times stronger than steel, and one-sixth the weight (Allhoff, et al, 2007). 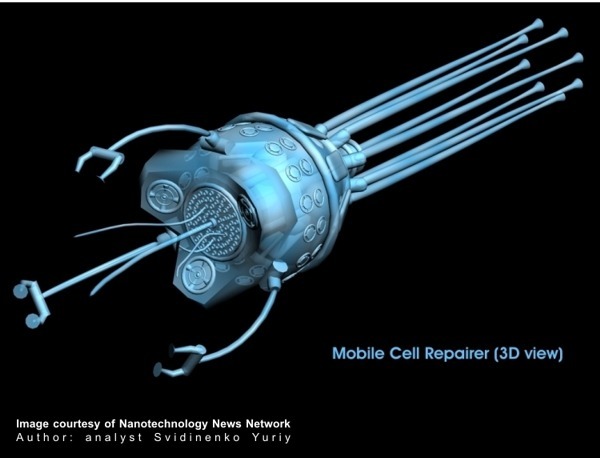 Applications of nanotechnology include: molecular robots (nanobots) implantable into the human body to monitor and modify physiological functions, disease modification, drug delivery, enabling cellular repair, counteracting the aging process, nano-level surveillance cameras for government use, nano-warfare, bio-warfare, and polluting or purifying water and food sources, just to name a few. The waste products of nanotechnology have the theoretical potential to induce disease, and so environmental concerns are emerging. Studies are ongoing to determine the true risks. One particular nanobot application is incredibly amazing: Brain computation and capacity. The human brain has a hundred trillion connections, and calculates at 1026 calculations per second. Brain implants will be capable of enlarging our memory a trillion-fold as well as improve sensory input and cognitive abilities (Allhoff, et al, 2007). The implications of wireless networks running our brains (or part of them) causes certain questions to emerge surrounding the topic of personhood. Is our personhood determined by who we are without enhancement or with enhancement or both? These coming changes in the next two-three decades should compel to us to consider the urgency of the ethical, social, philosophical, and religious implications. Already the city of Berkeley, CA, is a step ahead and is developing regulatory policy on nanotechnology. *How will nanotechnology alter our perception of “person”? Or will it? *How will our concept of “health”, “disease”, and “wellness” change with the inevitable nanotechnology applications? *Will new nursing theories be necessary? In what way? *How will the basic meanings of nursing change? Or will they? Think about it and wrestle with it. Bring it up with your colleagues and fellow students. Let me know what you think. 1. http://en.wikipedia.org/wiki/Nanotechnology. Accessed January 26, 2010. 2. Allhoff, F., Lin, P., Moor, J. & Weckert, J. (2007). Nanoethics: The Ethical and Social Implications of Nanotechnology. Hoboken, NJ: John Wiley & Sons.